Caption slip reads: "Photographer: Brunk. Date: 1956-07-19. Reporter: Sid Bernstein. Assignment: Cross-burning at 7470 Franklin avenue. 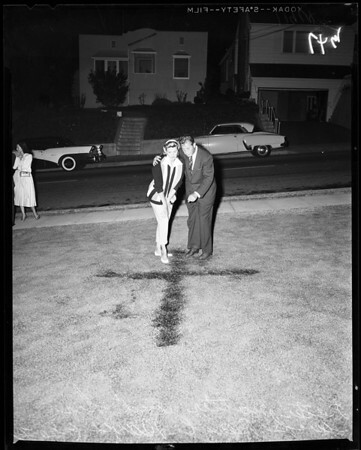 Peter Potter and his wife, Beryl Davis, at six-foot square cross burned into lawn of their home with gasoline".